Added by Indo American News on July 28, 2017. Organizers of Didi Ma event in Houston. 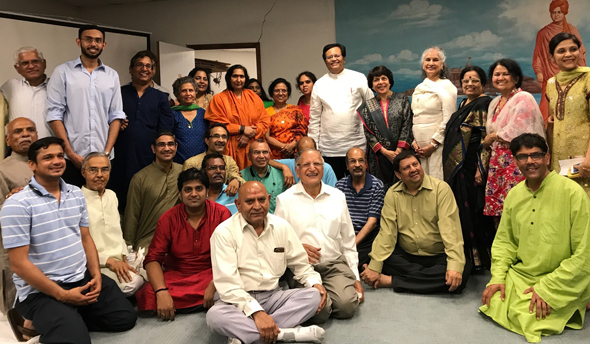 HOUSTON: Sadhvi Ritambhara Devi’s oratory skills are legendary and a packed room of prominent Hindu leaders in Houston were witness to the full force of that power on Saturday, July 22 at Keshav Smruti. Using equal measures of humor and gravity, Ritambhara Devi spoke about spirituality, her work with destitute children and women, and her vision to build a museum to showcase Hinduism—a first of its kind in the world. Construction is already underway on a 12-acre plot and will utilize state-of-the art, high-tech innovations to exhibit and explain the tenets of Hinduism. 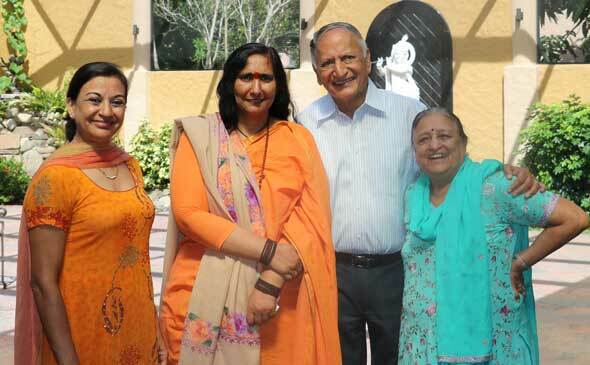 Hindu philanthropist Brahm Aggarwal of Florida announced a donation of approximately $1.8 million for this unique project in Vrindavan, whose opening is scheduled for 2020. The museum will also feature the contributions of women through the four Yugs or ages—the Sat, Treta, Dwapara and the Kali Yug. Women like Draupadi and Janaki are well known, but Hindu scriptures are equally replete with examples of powerful scholars like Lopamudra, who was a philosopher and the principal of an important Gurukul during the Sat Yug. From left: Rohini Gupta, Didi Ma, Braham Aggarwal, and Krishna Aggarwal. Other exhibits will include explanations about Hindu deities and their mode of worship and the story of the Purus Avatars. Life-like sets and the use of special effects will depict the Hindu ancient civilization and the different jugs or ages. Most people know of Sadhvi Ritambhara Devi as a fearless Hindu leader who made headlines with her fiery speeches during the Ram Janmabhoomi movement. At that juncture, she could have easily opted for a successful political life but veered away to become Didi Maa to thousands of poor children and destitute women. As a child, Nisha as she was named, was reflective and displayed a detachment from worldly things. During her second year of college, she went to an ashram in Haridwar to seek some of life’s answers. Three months later, she met her Guru—Mahamandaleshwar Swami Parmanand Guruji Maharaj and was given the name Sadhvi Ritambhara Devi. Didi Maa runs a Vatsalya Gram or a Village of Maternal Love under the Param Shakti Peeth Trust in Vrindavan. The birth of this village began when a day old baby was abandoned on the front steps of the ashram she was staying. She started with 22 children in two rooms and gradually expanded to include widows, abandoned women and the aged. The structure is based on a unique concept of making a Vatsalya family where five girls, two boys, a mother, aunt and a grandmother live like a family in an independent house. There are several such families housed there, which in essence, becomes a children’s home, a women’s shelter and an old-age home all in one. There are seven Vatsalya Grams in India today. Vatsalya Gram has an English medium school based on the CBSE pattern. Good values and morals are taught along with yoga and meditation. Today, they are graduates, post graduates and working in good jobs. The team effort of emcee Gitesh Desai, Event Coordinator Achalesh Amar, Hindu Swayamsevak Sangh Houston President Subhash Gupta, President of PSPA Shekar Reddy, Hindus of Greater Houston Vijay Pallod, VHPA Texas Chapter President Girish Naik, Rajni Jain director of Param Shakti Peeth America Youth Coordinator Vitec Sharda and many other volunteers was displayed in a smoothly organized event.